Julie Olsen Edwards began her early childhood education career working as a family child care provider as a way to stay home with her new baby. She went on to work for Head Start, teach in private and public preschools and parent cooperatives, and teach kindergarten and reading in elementary schools, and work with the community teen mother program. For 38 years, Julie was on the faculty of Cabrillo College's early childhood education department, served as program chair, and was founding director of the campus Children's Center. A lifetime activist for children and families, she continues to write, teach, and consult on issues of equity, diversity, and anti-bias; emerging literacy; and family life and empowerment. She served on the NAEYC Governing Board during 2003-2007. The eagerly awaited successor to the influential Anti-Bias Curriculum! 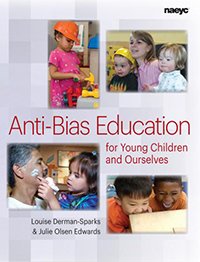 Become a skilled anti-bias teacher with this volume’s practical guidance to confronting and eliminating barriers of prejudice, misinformation, and bias about specific aspects of personal and social identity; most importantly, find tips for helping staff and children respect each other, themselves, and all people.